With Lenor you can now transform that "Love at First Sight" feeling into a long term love affair with your clothes. Using Lenor Spring Awakening will help to fight against the three signs of clothes ageing. This fabric conditioner is developed to nurture, enrich and help maintain fabrics from day one while its Anti-Age3 technology helps protect from stretching, fading and bobbling, to keep clothes looking beautiful for longer and fresh. Furthermore, wrapped in the scent of spring flowers and hints of natural patchouli and white cedar, you can look forward to a revitalizing, uplifting experience that will leave you feeling invigorated and totally refreshed. Use Lenor fabric softener with Ariel pods as part of your laundry routine for fabulous freshness and comforting softness. Why not add Lenor Unstoppables too, an in-wash scent booster, for up to 12 weeks of boosted freshness. 44 washes based on 25ml per wash.
Fresh bed every night up to 1 week. Long lasting freshness. Fabric Conditioner with spring flowers, hints of natural patchouli and white cedar scents. Gives clothes a soft and comfortable feel. Help to enrich and preserve the relationship with your clothes. Reduces wrinkling, makes ironing easier, reduce drying time and decreases static cling. EXTRA FREE Liquid (vs. R.R.P. of previous 1100ml bottle). Lenor fabric conditioner gives you long lasting freshness - a fresh bed every night up to 1 week. Lenor Spring Awakening wrapped in the scent of spring flowers and hints of natural patchouli and white cedar, you can look forward to a revitalizing, uplifting experience that will leave you feeling invigorated and totally refreshed. 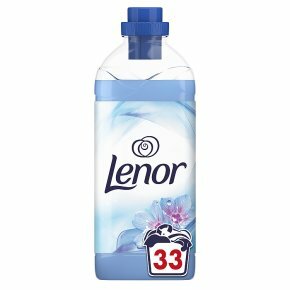 Use Lenor fabric softener with Bold 3in1 pods as part of your laundry routine for fabulous freshness and comforting softness. Why not add Lenor Unstoppables too, an in-wash scent booster, for up to 12 weeks of boosted freshness. And now EXTRA FREE liquid (vs. R.R.P. of previous 1100ml bottle). Liquid fabric softener can increase fabric flammability. Using more than recommended can increase this effect. Do not use this product: - On children's sleepwear or garments labelled as flame resistant as it may reduce flame resistance. - On garments made with fluffier fabrics (such as fleece, velour, chenille, and terry cloth). Keep away from children. Keep away from eyes. If product gets into eyes rinse thoroughly with water.